The flyover curves left. Light traffic does its daily plod on a brilliantly lit but otherwise unexceptional afternoon in an anonymous Indian city. I see a break and open the throttle with intent. The motor's gruff, almost annoyed rumble deepens into an unholy, evil roar. The front rises sharply and the rear squats as the torrents of torque I've just unleashed reach the rear sprocket. Tiny chunks of rubber shear off the Pirelli Supercorsa SP as the performance tyre is called on to deliver. It does. The numbers on the speedo collapse into random LCD lines. The tacho needle blurs upwards sharply. 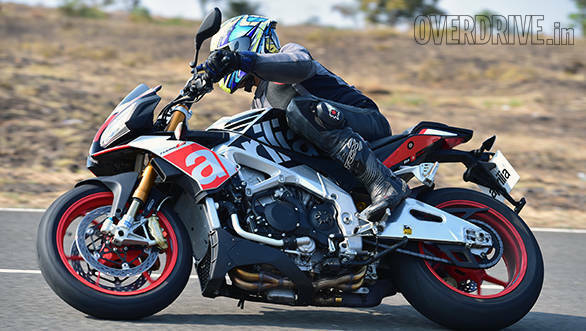 I've to lean in more and more to keep my line as the Aprilia Tuono V4 1100 Factory, as they say, sends it. I never saw the crest. I feel the wheels leave the ground and then the rear starts to come around. I fight the instinct to close throttle. A moment later, we land gently, Ohlins' best really are the very best  long proved. Flashing lights on the meters are the only sign I have of what happens next. Aprilia's extraordinary electronics package, APRC (Aprilia Performance and Ride Control), walks into the room calmly, looks at the mess I've made, waves a casual finger like a God might and fixes everything. Holy freaking cow! It took me 24km to leave town and break out on to open roads. But by then, it was too late, I was smitten. 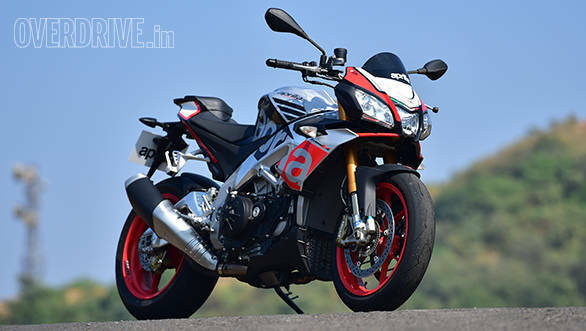 Aprilia's Tuono V4 1100 Factory is a magnificent, triumphant sport naked that blends impossible performance with impeccable control. Any one who rides one and doesn't instantly want to own one should really get a full physical for they might be dead and may not have realised it. The Tuono story begins in 2002 with Aprilia's RSV Mille superbike, a large, bruisingly fast sportsbike. 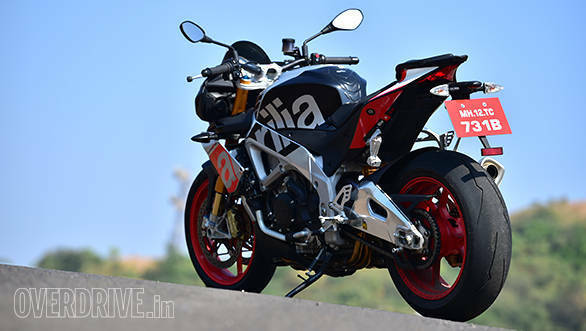 Aprilia decided that a naked version of it might be nice. Thunder, they decided to call it, which is Tuono in Italian. The crucial bit is that Aprilia took a shortcut and decided to not bother with the usual detuning of the sportsbike engine. The result was a brutally fast naked that riders struggled to ride full-hard and then fell deeply in love with. It came with top drawer equipment and its devastating performance in skilled hands underlined how good a motorcycle the Tuono was at genesis. This one, the Factory, is two generations removed and it has two highlights really. The Italians lost all sense of perspective and decided that the Tuono needed a bigger engine. So they bored it out to 81mm creating this new 1,077cc V4. Which now makes 175PS. They drafted Seal Team Six to threaten the school bully. Then they went and created the Factory model. 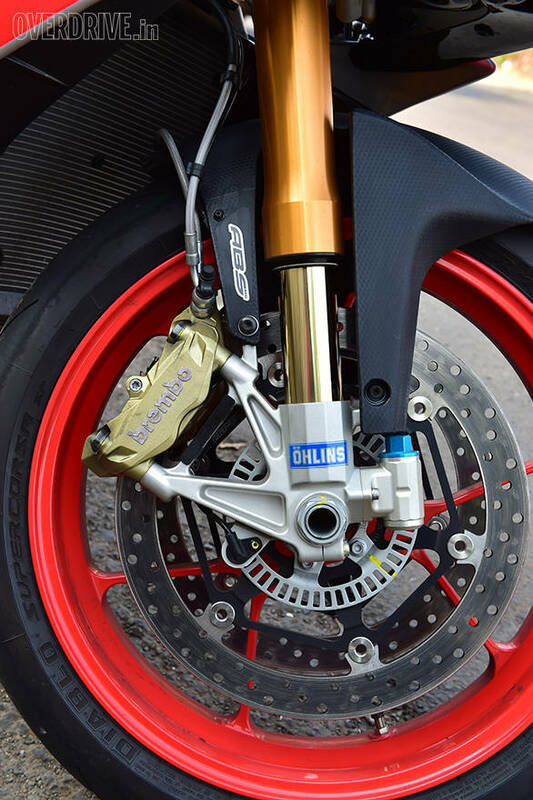 They called up Ohlins and asked for the best of everything and then called Brembo and made the same request. The Tuono Factory is substantially the most sophisticated sport naked you can buy on the planet. The very cutting edge when it comes to naked bikes with massive engines and incredible power. Given the power and the specification, I knew the Tuono would be special. I had no idea how much. Within 10km of leaving Piaggio's MotoPlex in Pune, I was already slack-jawed. The V4 sounds evil. Sitting at a traffic light, it's incredibly loud. It's an odd, off-kilter roar that sometimes reminded me of RD350s missing a beat and at other times, of pure intent. No sugary inline four hum here, chaps. The motor sounds all business and it really does go by sounding like a quiet MotoGP bike. The other source of my mandibular laccidity was its feel. The Aprilia is tiny. 390 Duke tiny when you sit on it. It also turns, flicks and slices through traffic with an ease and assurance that made me want to shake my head right off in disbelief. In 10 minutes of riding, I'd forgotten how nervous and scared I was of this diminutive 175PS bomb. I was throwing it about with complete confidence. It was this point that I noticed the electronics. The Aprilia has lots. I didn't touch the trio of ABS modes. I did mess with the engine braking control settings and I left it at the gentlest. I now understand why the MotoGP guys like these systems. The ECU injects a spritz of fuel when you have the gas closed. This offsets the hefty engine braking that the fat 200-section rear tyre and high compression V4 would normally generate. As a result, the Tuono felt utterly natural while setting up for corners and in slow traffic. I never had to fight a dipping front-end. For all the world, it felt like I was riding a 4-500cc single cylinder. During all this, traction control was doing all the work, cranked up to 8, the safest setting. To Aprilia's credit, I only actually noticed the traction control system over a short stretch of staccato bumps. The rest of the 500km went without the APRC system feeling like it was on. The sole sign of its presence is that the Tuono gets feistier and looser as you go down from 8 to 1. I found level 1 very scary on our roads where small bumps will either send the front into the air or the rear will start to spin and slide. Or both. Turn it off  naturally, you can  and you need nerves of steel and the restraint of a monk to get anywhere without potentially launching yourself into low Earth orbit. I found home when I went down to 4. You'll have the odd thrilling powerslide and the Tuono will catch air coming over crests that the electronics will reign in after some float. Perfection from sheer invisibility. Sometimes, electronics can completely mar a ride. 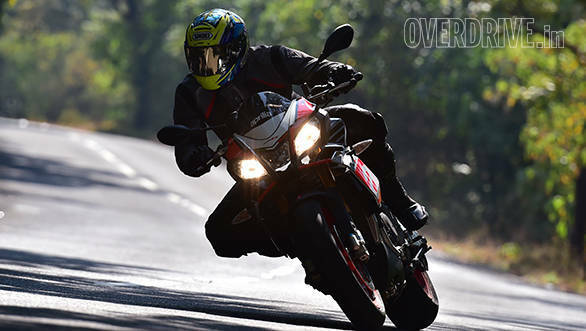 The first generation BMW S1000RR ridden through Mumbai was relentlessly jerky and annoying. I almost forgot how powerful and capable it was. 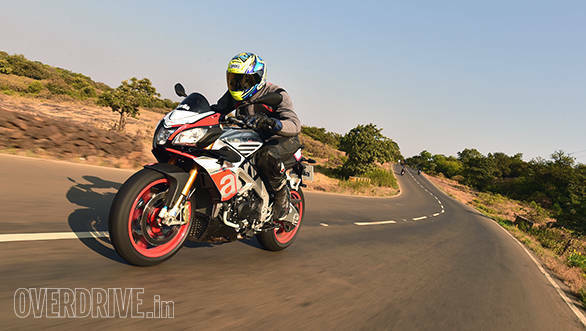 The Aprilia's ferocious performance never plays second fiddle to anything. It's got riding modes that are all full power and any electronics activity is substantially invisible. Until you realise that you're not a hero but miraculously able to ride like one. What the bike is outstanding at, is delivering storming acceleration. It always seems to have a lot more grunt left in store. It doesn't really care what gear you're in at any time. Get past about 4,000rpm, nail the gas, then watch the world go by super fast. The Tuono gets to impossible speeds so easily that you wonder where the catch is. But the V4 is catch-less and uncatchable. It churns out epic torque and power and sings that unique baritone song all through happily and lustily. Revs rise and drop so quickly that you wonder if they forgot to install the crankshaft. Even more amazing is that the rough, noisy V4 sound doesn't translate to your throttle hand. 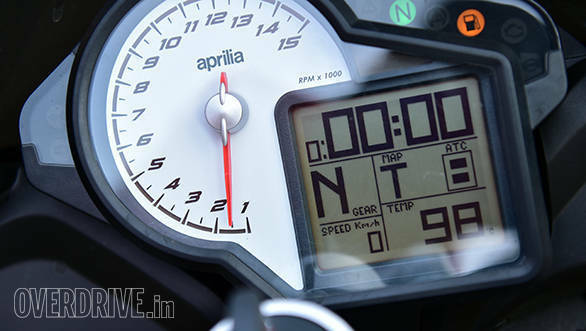 The Aprilia intimately connects your brain to the contact patches. Despite the noise, you have the sense of a buttery smooth, robustly powerful engine. It's pure genius. 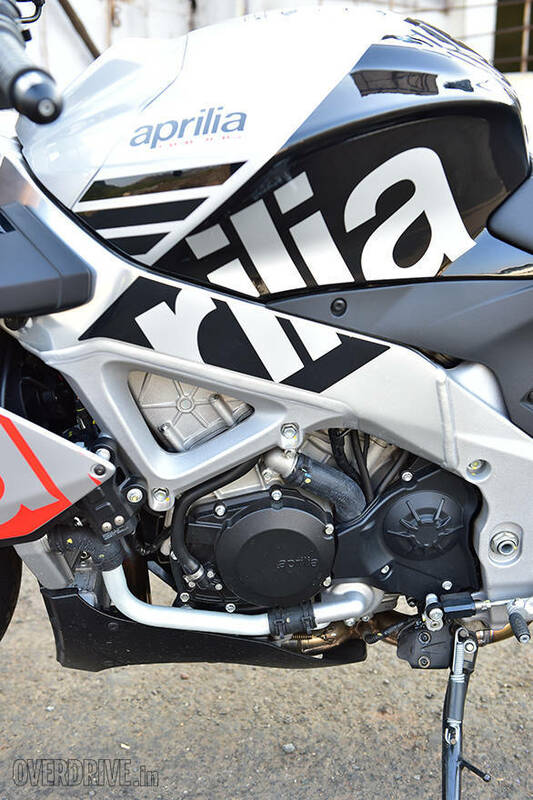 Aprilia also gave the bike a slipper clutch and a quickshifter. This is terrific too. It makes clutch effort laughably light. You'll love the feel of the quickshifter. Substantially, you prod the shift lever up without changing your throttle position. The system cuts the spark momentarily and the shift goes through. It feels terrific and it sounds from the outside like you're a gearshifting God. And now we come to the chassis. Which is as marvellous and eye-opening as the engine. 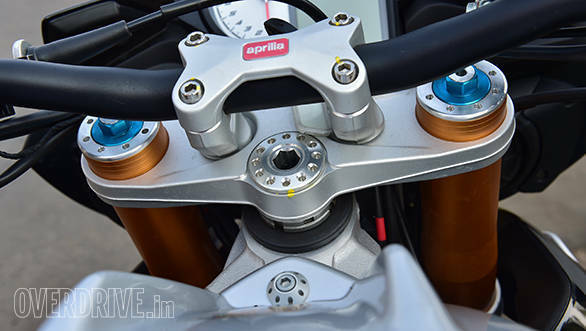 Aprilia used a polished aluminium twin spar frame and an equally shiny, hefty swingarm. They sharpened the rake a bit while altering the offset. What that does is keep the front axle in the same place relative to the centre of gravity while reducing trail. They also managed to increase the length of the swingarm a bit. 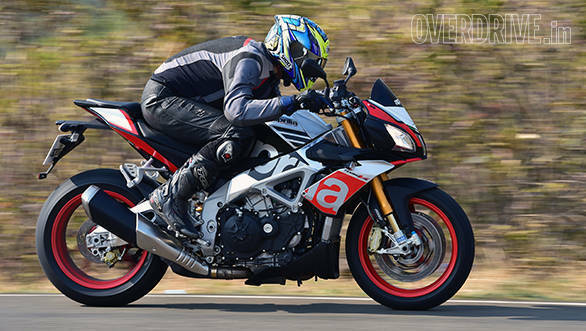 Sharper, more agile but even more stable at high speeds, say Aprilia. When you put the world's best brakes and suspension and then spoon on some of the stickiest rubber on sale, the chassis is able to perform magic. In 15 years of testing, I've never felt this level of precision, response and control. The Tuono is willing to feel loose and naughty if you like but it understands the need for surgical precision. Calm down and get serious and it does too. The pace at which the Tuono inhales corners is ludicrous. It acquires heavy lean angles smoothly and quickly. And then you'll see the size of the chicken strip left and weep. It's beautifully poised and calm mid corner. As you come back on the gas, the connected throttle feel, a direct sense of the rear contact patch and the graceful seriousness of the chassis allow you up the exit pace way harder than even you think is possible. The electronics fill any gaps in your talent. The magic bit? The Tuono will dance lightly even over bumpy corners and, shock and awe, over tarmac with entire chunks of the top layer missing. This is at serious lean and speed without murmur or complaint. It left me bewildered, awed and gobsmacked. You'll notice the same magic down the open road as well. Soft or gentle the Tuono Factory most certainly isn't. But it's as if there is a forward looking radar that's got every minute detail on every bump well in advance. The wheels almost never get flustered and the Tuono lightly, cheerfully patters over anything. It's eerie how smooth the Tuono makes roads feel and how much power it can lay down even over broken roads because the suspension is so supremely effective. I've never, ever, experienced anything like it. What we have here is an incredibly fast machine that combines good old-fashioned engineering and cutting edge electronics into a weapon that's as easy to wield as it is devastatingly effective. The Tuono slips between the ribs like a stiletto knife and makes a home in your heart. Now let me get to why it makes such a huge impression. That's because despite all of these wide ranging and sharply honed talents, the Tuono isn't fussy. Not even the slightest bit. Anything above 60kmph is okay for sixth gear and I've trundled through crawling traffic with ease and composure. Ashok and I ran the Tuono as ragged as we dared, and then as smoothly as we could. We couldn't knock it. 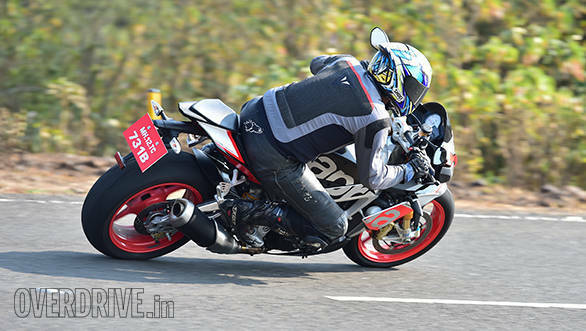 It settled into a highway cruise between 100 and 130kmph with an ease that beggars belief. The seat is far, far better than it looks and that fairing is good for a steady 180kmph wind blast effortlessly. I thought that handlebar could've been higher initially but it proved me wrong there too. Three days of endless pavement pounding has left me only with Tuono shaped holes in my heart and my garage, no aches or pains. What I couldn't do is take this thundering Italian to a racetrack but both anecdotal reports and its cornering manners suggest it'll hunt down apexes with an evil gleam in its eye and a mile wide smile on my face. The only thing I think needs work is the high beam. It beams powerfully out of the middle headlight and Aprilia shut down both low beams when you use it. This creates a narrow spot that reaches far but leaves the sides in almost utter darkness. This might be good for predictable European traffic but in our conditions, I'd like to keep the throw and demand more spread. The Tuono casts a powerful spell. It left me aching to own it. 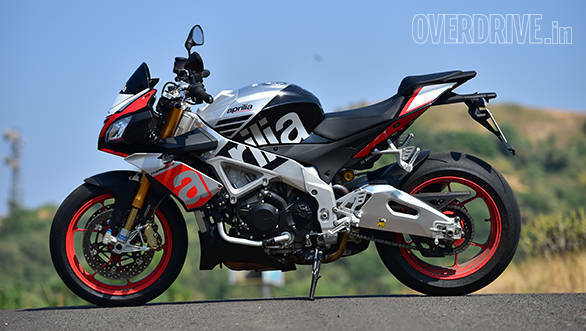 The Tuono's Rs 21.04 lakh on-road Pune is a bridge too far for me. But what a magnificent bridge. Never before have I struggled with the idea that a test bike has to go back to its maker. Never before have I wanted a motorcycle to be mine so badly. To think that I didn't know how vital and visceral a V4 can be just three days ago. The Tuono is magic. It's fast, controlled, enormously capable and emotionally it's a nuclear bomb. It also costs the Earth, as befits a motorcycle that's almost certainly a pinnacle of things of this kind. So persuasive is its appeal and promise that I'm sold. I'd buy it in a heartbeat. If only I could.